The casual visitor seeking the centre of Dawley in the late 18C would have been directed to the environs of Holy Trinity church. After that time, the area around the Lord Hill Inn known as Dawley Green, became increasingly popular with commercial activities. It became the de facto centre of Dawley. A tradition of non-conformism in the parish was established early on. In 1819 the first Wesleyan Methodist chapel was built at the junction of Chapel Street and the future High Street. By 1840 Dawley Green lay at the heart of several mining communities, and the population rose with the burgeoning collieries, ironworks, and branch railways. It was also a time of new recreational traditions with sports, wakes and ‘pleasure fairs’, events often sponsored by local tradesmen. 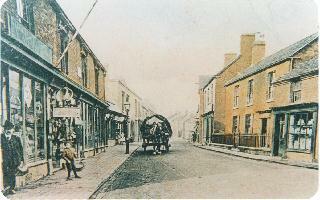 Sometime between 1851 and 1861 Dawley Green finally became known as the High Street. Over the succeeding decades the town and its High Street continued to prosper, acquiring a library and reading room, and a handsome, purpose-built market hall. A snapshot of the High Street in the 1860s would have revealed a self-sufficient community with busy working trades in every department of life. In 1873 Dawley had its own town hall. 1876 marked the inauguration of the town’s ‘Special Day’ when all the non-conformist Sunday Schools congregated for a spectacle of processions, speeches, sports, music and prize-giving. The event grew to attract thousands, and was staged annually for a hundred years. In 1901 the town acquired a public park, and in 1909, twenty six years after his death, a simple memorial to the life of one of Dawley’s most illustrious son’s, Matthew Webb. In 1921 the ‘Cosy’ cinema was erected at the upper end of the High Street. The years after the early 1930s were ones of decline. The inception of the New Town in the 1960s brought benefits and removed much old sub-standard housing, but also many of Dawley’s historic public houses, chapels, market hall and other buildings of note, some being replaced with architecture perceived to meet the needs of a new generation. Despite the changes Dawley retains one of the best preserved forms of a typical Victorian High Street, nowadays pedestrianised. It continues to offer a diversity of services and retailing within the context of a strong sense of local community. Read more about the history of the High Street. • The centre of Dawley in the late 18C would have been in the area around Holy Trinity church. • By 1840 Dawley Green saw a significant rise in population with the burgeoning collieries, and industrialisation in the north of the parish. • Between 1851 and 1861 Dawley Green finally became known as the High Street. • In 1873 Dawley had its own town hall. In 1901 the town acquired a public park, and in 1909 the Matthew Webb memorial was erected. • The years after the early 1930s were ones of decline. The New Town in the 1960s removed much old sub-standard housing, but also many of Dawley’s historic sites. • Despite the changes Dawley retains one of the best preserved forms of a typical Victorian High Street.